Born Rice Lake, Wisconsin, July 30, 1990. Graduate Rice Lake High School, 2009; interdisciplinary B.A. 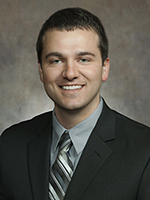 in Political Science with emphasis on Public Leadership, University of Wisconsin-Green Bay, 2014; attended University of Wisconsin-Barron County and University of Wisconsin-Eau Claire. Full-time legislator. Former Coca-Cola salesman. Rice Lake City Council, 2009–10; mayor of Rice Lake, 2010–12. Elected to Assembly since 2014. Leadership positions: Majority Caucus Vice Chair 2019, 2017.